Badgerland Lawn and Landscaping provides fast, professional, satisfaction guaranteed lawn maintenance and landscaping services throughout southeastern Wisconsin rooted in Waukesha County branching off to Milwaukee, Washington, Dodge, Dane, Jefferson, and Walworth Counties. Badgerland Waukesha landscapers are dedicated to recreating your landscaping visions down to the dirt bringing your landscape designs to life. No matter what your Waukesha landscaping needs, Badgerland Lawn and Landscaping will lay the path to a visually appealing lawn and landscaping masterpiece. Experience the commitment to quality, persistence in details and overall value of lawn care in the Badgerland Lawn and Landscaping Difference. The Badgerland Lawn and Landscaping difference is the dedication to quality lawn and landscaping services. Badgerland Lawn and Landscaping offers the finest Waukesha landscaping services from mulch delivery to hydro-seeding to even commercial snow removal. No matter what your landscaping needs, big or small, Badgerland Lawn and Landscaping Waukesha landscaping services are the stepping stones to completing your landscape vision. With a vast fleet and up-to-date landscaping equipment, Badgerland Lawn and Landscaping Waukesha is able to provide reliable on-time, quality landscaping services throughout the Milwaukee and Madison areas. From commercial Milwaukee landscape maintenance to residential Waukesha lawn care services, Badgerland Lawn and Landscaping Waukesha sets the path to all your Milwaukee area landscaping and lawn maintenance dreams. The Badgerland Lawn and Landscaping difference is the caring relationships we grow directly with our valued customers. As good communication is key to recreating a clear-cut landscape vision, Badgerland Lawn and Landscaping attentively listens to your landscaping requests paying close attention to the precise details. The Badgerland Lawn and Landscaping difference comes from the ‘little extras’ we focus on going above and beyond what you ever thought possible. Badgerland Lawn and Landscaping designers won’t rest until your individual landscape and lawn visions are revealed. The Badgerland landscaping solution enhances the beauty of your landscape with intertwining lawn and landscape designs, aesthetically pleasing layout, and overall visual appeal. The Badgerland Lawn and Landscaping solution truly is a living, growing work of art. The Badgerland Lawn and Landscaping difference lies within the hundreds of satisfied landscaping customers. At Badgerland Lawn and Landscaping, our job is not over until you are completely satisfied. Badgerland Lawn and Landscaping Waukesha provides on schedule, within budget, high quality landscaping services locking in the Badgerland lawn maintenance and landscaping design satisfaction guarantee. Your Badgerland Lawn and Landscaping experience is sure to be nothing less than amazing. There is simply no comparison when it comes to a Badgerland landscaping solution. 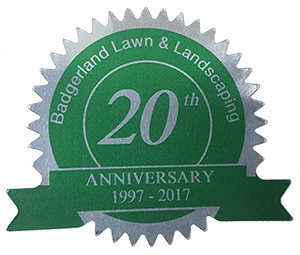 We guarantee once a Badgerland customer, always a Badgerland customer, as satisfaction comes standard at Badgerland Lawn and Landscaping Waukesha. Experience the Badgerland Lawn and Landscaping difference first hand. Don’t let the thought of lawn care get you down in the dirt, contact Badgerland Lawn and Landscaping Waukesha today to plant your landscaping visions and watch as they bloom into a landscape reality.